This lovely app never disappoints me. Just when I need some encouragement *bloop* a Notification pops up on my phone & I immediately feel like a BO$$ lol !!! I love how it switches tones one day you might get “ Stay True To Yourself & Remain Humble.” & the next day you get “Level Up & Let Them Know Wassup, Show Them Who You Are.” (Came up with these phrases as an example lol) I love the balance that it gives one , from “Remain humble” to “I’m not the one to play with sis” lol. It’s absolutely random but on time.. keep it up !! 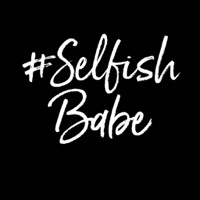 I was really hurt and down about stuff these past couple months and your app has taught me to be resilient and see the good in all and most importantly be A SELFISH BABE! 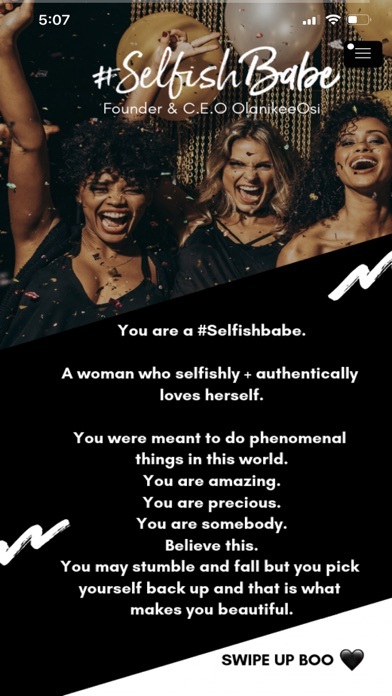 Selfishbabe is a wonderful app and the daily notifications it sends makes you feel so good and strong about yourself! I love it. I swear every reminder literally goes w what’s going on that day and it sets me straight ✨💕 get this app so you can be reminded of your power & to stay in alignment ✨🙌🏾 instagram @divinexfemme 💗👑 thanks for all you do for us queen!!!! I downloaded and I don’t regretted. When I downloaded for the first time this app, I thought that it would be another “girly” app but I was wrong. I love and hate this app, why hate? Well, because the first time I downloaded, I wasn’t on “my days” I was more curious, I thought not for that moment but for the moment that I will need, do you get me? So when I had “those days” it really changed my mood, if I was crying and pop one of their notification, it made me smile, if I was depressed, it make my mood change to good even a little bit, and even when I was just stressed, it popped up a notification and that made me to forget why I’m stressed, but when I’m normal ( I mean without depression or stress or whatever) I hate it lol because I think it is annoying 😅😅 however I love it, it’s like having that friend that annoys and fighting sometimes but at the end, you know that you love her. I recommend because soon or later, you will need it, at least download. 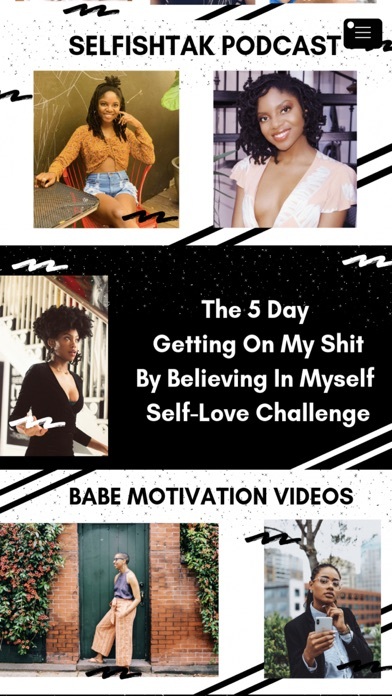 kiah.kiahh I loveeee love this app soooo much you have motivational texts thats get sent to you everyday, live podcast!, building my self-esteem was very hard for meee very hard. 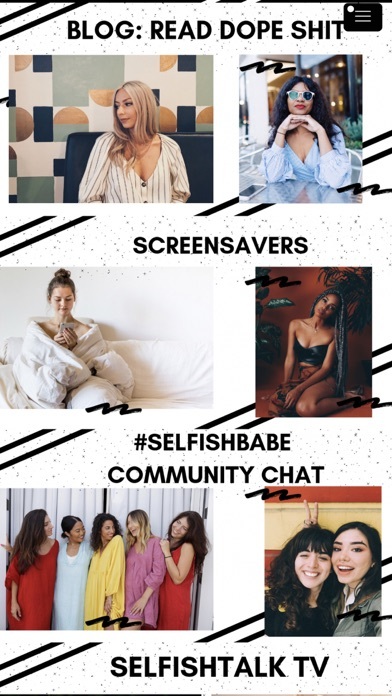 I sometimes have my insecurities but this app makes me feel like being a #SelfishBabe that these girls are my sisters. Im all here for the love and support ✨ and the uplifting one another i love it! I love this app! Everyday I get encouraging words sent to my phone to remind me who tf I am. I listen to the podcast on my way to work and I get to hear other women’s stories. Women go through a lot and this app is giving me that little nudge to do things for my business. It’s all about encouragement and becoming a better YOU. I love it. Download this app! You won’t regret it. After loosing myself in a long relationship and breaking up after 8 years, this app was exactly what I needed. It reminded me daily that I was good enough and hat I was capable of doing anything! Trust me when I say you NEED this app! @teainkd on ig.